Jean Piaget? Eleanor Duckworth? Apocryphal? Some websites list a citation in 1988, but Piaget died in 1980, and no information is provided about when or where it was spoken or written. Would you please examine the provenance of these words? Quote Investigator: In November 1964 the journal “The Arithmetic Teacher” published an article by Eleanor Duckworth titled “Piaget Rediscovered”. Duckworth had worked with Piaget as a student, and she served as an interpreter for the Swiss psychologist during some U.S. conferences in 1964. Piaget had recently attended two gatherings on cognitive research. One was held at Cornell University and the other at University of California, Berkeley. Piaget’s responses to questions from participants were recorded and translated by Duckworth. 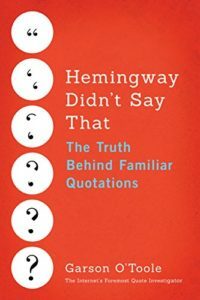 An instance of the quotation appeared in one of these responses. The principle goal of education is to create men who are capable of doing new things, not simply of repeating what other generations have done—men who are creative, inventive, and discoverers. The second goal of education is to form minds which can be critical, can verify, and not accept everything they are offered. The great danger today is of slogans, collective opinions, ready-made trends of thought. We have to be able to resist individually, to criticize, to distinguish between what is proven and what is not. So we need pupils who are active; who learn early to find out by themselves, partly by their own spontaneous activity and partly through material we set up for them, and who learn early to tell what is verifiable and what is simply the first idea to come to them. “The principal goal of education,” he once said, “is to create men who are capable of doing new things, not simply of repeating what other generations have done—men who are creative, inventive and discoverers. In conclusion, QI believes that Jean Piaget can be credited with the remark printed in the 1964 citation. Modern versions of the saying have been modified to more directly embrace males and females. Image Notes: Child with computer from PublicDomainPictures on Pixabay. “Reach for the Stars” image from Wikimedia Commons was created with POV-Ray 3.6 and rendered on the International Space Station (April 25 – May 5, 2002) by astronaut Mark Shuttleworth. This project was commissioned by Chris Cason, coordinator of the POV-Ray Development Team. The “Reach for the Stars” file is licensed under the Creative Commons Attribution 2.5 Generic license. Jean Piaget image from Wikimedia Commons was provided by Roland Zumbühl of Picswiss. This file is licensed under the Creative Commons Attribution-Share Alike 3.0 Unported license. Image files have been cropped and resized. Update History: On June 9 the 1968 citation was added.